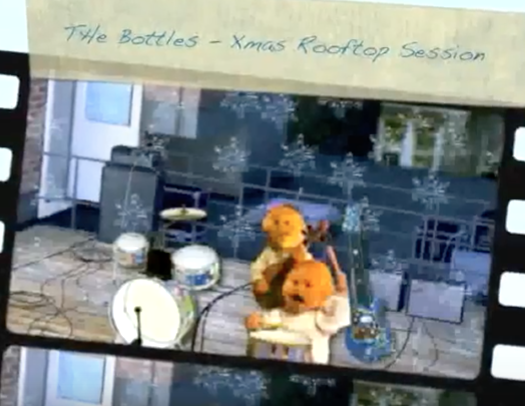 The Bottles – Xmas Rooftop Sessions: Winter 1988 From the archives of Rotten Banana Records comes this rare live recording of The Bottles in their very, very early period. Featuring original members Soily Simon (guitar, vocals) and Robby Dumpers (drums, vocals, assorted cutlery). What started as a project to get the band playing live together again, and to help rekindle the spark that had once brought them great popularity with the “under 5 crowd”, turned out to be a session filled with temper tantrums, spilled Pablum, and, of course, plenty of soiled diapers. To further exacerbate the tense sessions, Soily Simon insisted on bringing along his new playmate, Baby GaGa, who, apparently, did not want to share her toys with Robby Dumpers. Disaster was imminent. This live performance (the last by the members performing together as The Bottles) was staged on the rooftop of the Rotten Banana headquarters, located in the NDG suburb of Montreal, as a publicity stunt to garner interest in an upcoming studio album that, alas, never saw fruition.